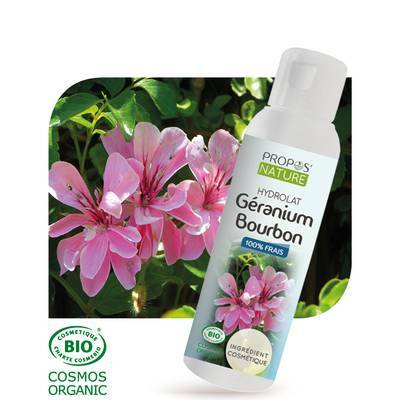 Regenerating, soothing, and purifying, Bourbon geranium floral water is perfect for all skin type cellular regenerating care : young and mature, dry or oily, with problems or sensitive. Astringent, repairing and balancing, it is used to fight against spots, skin irritations, sunburns, red patches and to calm razor micro-cuts. It helps to tighten your pores and slim skin texture for a skin obviously more beautyfull. Pelargonium graveolens flower/leaf/stem water*, Benzyl alcohol, Dehydroacetic acid, Aqua.